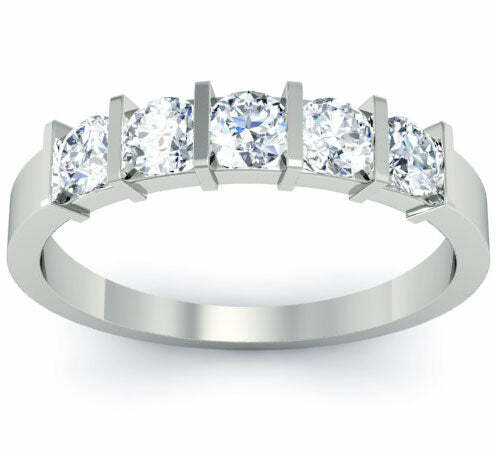 5 stone diamond rings are amazing and thoughtful anniversary gift ideas. Even though your wife adores her engagement ring and wedding band, many women crave a little more bling and a little more sparkle to brighten their days. They dream of the day that a significant wedding anniversary is to come because it is a chance for them to change up their wedding set in a different and new way and with a five year anniversary gift, it is the perfect way to allow her to do this. 5 stone diamond rings are not only symbolic of the five, lovely years that you have spent together as husband and wife, they are also quite versatile. These rings can be worn in addition to the entire wedding set or even serve as a wedding band upgrade. 5 stone diamond rings can even be worn as right hand rings if she would rather leave her wedding set in tact as is. However, they do provide an option just in case she does wish to pair her engagement ring with something a little different in the future. These rings are perfect because they are available in different diamond cuts, carat weights, and setting styles. It will be easy to choose the right ring for the one you love.